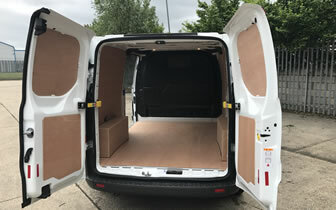 Van System can line the inside of your van with ply making it suitable for fitting out with our storage system products. Ply Lining also increases the durability by protecting expensive body panels and reducing wear and tear, therefore increasing its useful life and residual value of your vehicles. Ply lining also improves the appearance of a vehicles interior, creating a more professional image - when this is combined with our Vehicle Racking, Drawer Units and Cabinets the image presented is streets ahead of your typical 'man with a van' tradesman. Why not stand out from the crown, get yourself organised and start saving money in the long term... speak to Van System today to arrange a consultation. From the start we can help plan and advise you on your requirements. We use a computer aided system which matches the space you have available to the modules that are suitable. There are many options available, meaning each vehicle can be tailor made to your exact needs. All Van System modules are fitted by our factory trained installers who have vast motor industry knowledge and experience. This means the systems are fitted securely with no risk of damage to your van. We know how important your vehicle is to you and in order to keep downtime to a minimum, we offer a very flexible service. 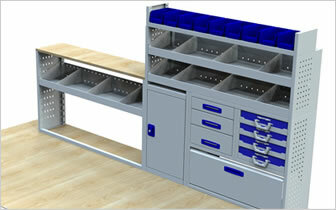 Including mobile fitting, collection & delivery and overnight or weekend fitting. Plus all Van System Racking Modules have been crash tested and TUV accredited within Europe - for full information see our Crash Test Page.